Tesla has the ambition to sell hundreds of thousands of Model 3s per year, which would make it one of the biggest vehicle programs in the world. If they actually achieve that, it will inevitably have a strong impact on the market and especially the mid luxury sedan segment. Facebook millionaire turned venture capitalist Chamath Palihapitiya thinks that BMW’s 3 Series will be most impacted. He even suggested that Model 3 could wipe out sales of the popular sedan. He is referring to when the Model 3 will have regular custom-to-order availability, like Model S and Model X. Considering Tesla has a significant backlog of almost 500,000 Model 3 reservations, that’s not expected to happen until the second half of 2018. 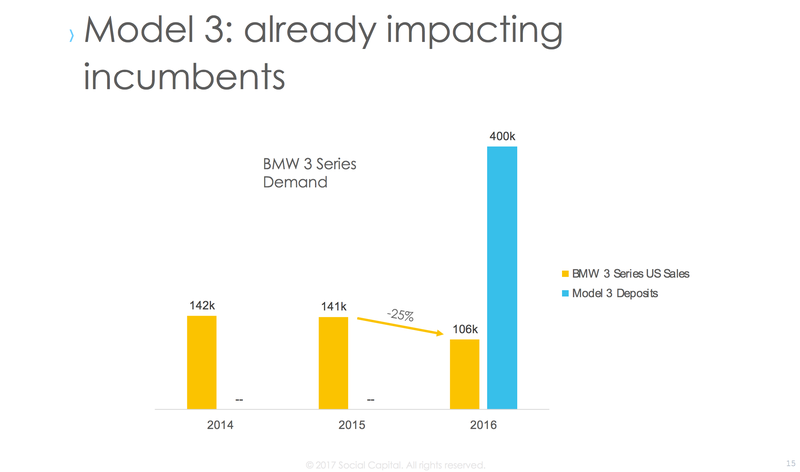 While there’s nothing directly linking the decline to Tesla Model 3 reservations, BMW 3 Series sales are still falling in 2017. BMW delivered just over 63,000 units in the US through August or about 6,000 fewer units than during the same period last year. But does it mean it will “go to zero”? Unlikely. The BMW 3 Series is one of the most successful vehicle programs in the auto industry today. While its US sales have unquestionably been slipping, it has been doing better in other markets. BMW is also rumored to be working on its own electric 3 Series that could mitigate the impact of the electrification of the industry on the vehicle program. But in the meantime, yes, it looks like the Model 3 could have quite an impact on 3 Series sales. As we reported in our Tesla Model 3 vs BMW 3 Series comparison, Tesla’s new sedan compares favorably in term of pricing and options with the 3 Series – and that’s before accounting for any EV incentives or the cost of operation. What’s even more telling, a not-so-scientific poll even showed that the BMW 3 Series was the most popular car that Model 3 reservation holders were replacing. Tesla’s Model S already has a strong impact on its own segment in which it outsells Mercedes S-Class, Porsche Panamera, and BMW 6/7 Series combined in the US. Can Model 3 have a similar impact? Let us know what you think in the comment section below.